One sentence became my demise. I should’ve heeded her warning. Only I didn’t. Andrew DeLuca came into my life when I needed him the most. His faith and love made me realize I could live the life I’d always dreamed. Only it was all a lie. Tragedy struck just like I knew it always would. Weston Corbin breezed into my life without any warning. Refusing to take no for an answer. Making me feel when all I wanted to do was hide. How do you find a way to live when death is all you’ve ever known? My name is Magdalena DeLuca and this is my story. 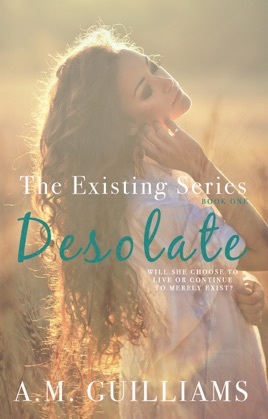 DESOLATE is the first installment of the three part series, The Existing Series, that's full of angst and is guaranteed to grip your emotions until the very last page. Each installment of the series can be read as a standalone. Tissues will be required. ....I've read thousands of books in my life, but....this one was the most asinine I've ever read. A stupid pity party, so cornily written that I've never met one person who talked like these cardboard characters. The ending was so ludicrous, no spoilers, that I actually did not finish reading it. Just rushed to the end so I could warn anybody foolish enough to read this amateurish, poorly edited excuse for a book to save their money. Whatever the people were paid who wrote those 5 star reviews must have been a lot - but at least they were spared having to actually read it.